Wow!! We're extremely impressed with your level of personal service, the high quality of duplicating our videos to disk and the expediency that your staff performed this task. Thank you for saving our family treasures. Your video tapes can degrade over time so protecting your movie memories with our tape transfer service is a smart investment. In a Direct To DVD transfer, we do not edit out blank footage. It's simply a straight format conversion from video tape to a DVD. We encorourage you to number the tapes in the order you would like them transferred and provide a Title for each. Use this worksheet to help you. In a Direct Tape To Hard Drive we convert your tapes into editable .AVI files and store the editable footage on an external USB hard-drive for you to edit at home. Video Tape Alchemy is a unique service that makes it easy for you to find, organize and present the golden moments buried inside your video tapes. We'll digitize all of your tapes. Our editors will then manually color correct and divide the video into individual scenes called clips. You then use our online video organizing system to eliminate unwanted clips, arrange the clips into any order and create digital photos from any point in the video. You can even move clips together that came from different tapes. Create title pages for each clip and each clip will be its own chapter point on the DVD and on the DVD menu. You can even create digital photos from your video tape footage. This is an easy, fun way to distill down your video tapes to just the best parts and then make those parts easy to find and watch. Send us a lot or a little. No minimum order! Not sure which service is right for you? Click here to learn more or Contact us for more information. All 3 Transfer services are available for any of the following kinds of video tapes. Video Tape Transfers- VHS, Super VHS, VHS-C, 8mm, Hi-8, Digital8, and MiniDV. 2-6 hrs - Video Home System developed by JVC utilizing half-inch tape, which is the most widely used video format. 30 mins-2 hrs - A higher quality version of the VHS videotape format with a sharper picture and resolution similar to that of HI-8. This format is used for videographers mostly for shooting and editing. 30 mins-2 hrs - Camcorders often have many of the best features found in higher priced HI-8 units, including image stabilization, strong optical and digital zooms and innovative special effects. Regular 8mm tapes are the exact size and shape as their HI8 counterparts, but record video at a lower resolution level, and therefore, are less expensive than camcorders which product better image quality. 30 mins-2 hrs - Camcorders record their signal at about 400 lines of resolution, slightly less than Mini DV, but substantially higher than 8mm or regular VHS formats. Most often, HI-8 camcorders record sound in hi-fi stereo. Slight quality loss is suffered when copying or editing from HI-8, but a better than average image is maintained. Tapes from HI-8 camcorders generally must be played using the camera as the source, which means the user often must connect cables to their television or VCR. 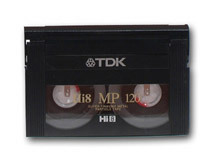 HI-8 tapes can be bought in 30, 60, and 120-minute lengths. 45-90 mins - 1 hr - A format that is far superior to HI-8 or 8MM. Sony was the first to introduce this format and has done a great job. It is backward compatible, meaning that the new Digital8 camcorders and VCR's will also play your 8MM and HI-8 tapes. You do not have to buy special tapes to record in Digital8. 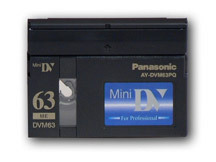 A regular 8MM or HI-8 tape will record up to 60 minutes of digital video and audio. Because of the design, using regular tapes is not a problem, but it uses twice as much tape. A 2 hour HI-8 or 8MM tape will record 60 minutes when done in the Digital mode and records up to 500 lines of resolution. 30-80 mins - The smallest of the video formats. They take and maintain crystal clear images because of the nature of a digital format. Editing enthusiasts benefit from Mini DV as well, since copying between two units is done with no quality loss. That means edited or copied video looks and sounds every bit as good as the original footage. Mini DV tapes are available in 30, 60,63 and 80 minute lengths. Digital camcorders have the highest resolution of all the camcorders, starting at 500 lines. You may also need to purchase the QuickTime MPEG-2 Playback Component. A Unique New Service Only From digmypics! Distill hours of video tape down to just your favorite scenes. Only digmypics offers this kind of functionality in tape transfers! Broken Tapes? We can fix 'em! Questions About Transferring Your Videos?